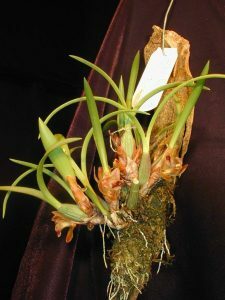 Maxillaria are quite unknown orchids, they are more often seen in orchid enthusiasts’ private collections than on common windowsills. 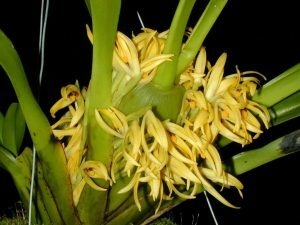 Most of them don’t have big showy flowers or other interesting features, but some of them, particularly Maxillaria tenuifolia, are popular for a fair scent of flowers – resembling coconut pie. 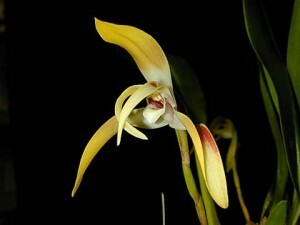 Maxillarias sometimes are called Spider Orchids for triangular shape of their flowers and its plant habit. Maxillaria arachnitiflora is even named for this feature. Also, they are known as Flame Orchids for some of them have bright red flowers or Tiger Orchids for flower color patterns of some species. One species is famous for having black flowers. 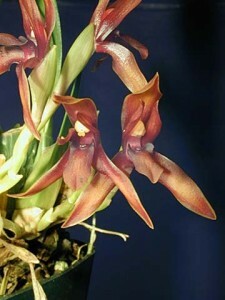 Maxillaria schunkeana has black flowers, which is rather rare within orchids. They are epiphytes, lithophytes, and terrestrials from tropical America. They are characterized by spherical to elongated pseudobulbs with one-two or more, often narrow leaves, short rhizomes, and creeping behavior. Some species of this genus are miniature sized such as Maxillaria reichenheimiana (which also has beautiful leaves with white dots) and Maxillaria schunkeana with black flowers. 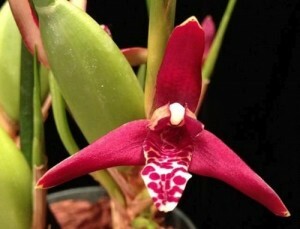 Maxillaria cogniauxiana has bright red flowers and lovely spherical pseudobulbs, accompanied with narrow leaves; Maxillaria crocea resembles crocus. 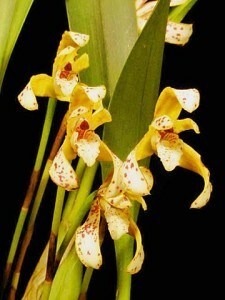 Also, there are medium sized orchids with rather big flowers such as Maxillaria grandiflora which has white flowers with purple lips, Maxillaria chrysantha with golden yellow flowers (chrysantha means golden-yellow in Latin), Maxillaria tenuifolia with brown-red, coconut scented flowers and pseudobulbs with solitary leaf, Maxillaria striata has big (up to 5 inches) striate (remember name “Tiger Orchid”?) yellow with red flowers, and Maxillaria picta with interesting color pattern on flowers. 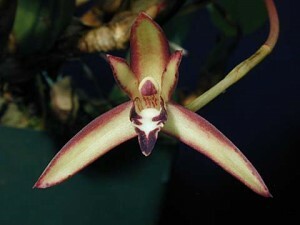 Maxillaria orchid care is not very difficult, except for some species from mountain rainforests. They need half shade to bright light without direct sunlight in midday, bright filtered light is the best for them, open. Well-draining potting mixture with some medium bark, sphagnum moss, cocoa chips, tree fern is suitable for them. Watering should be after potting mixture became dry. 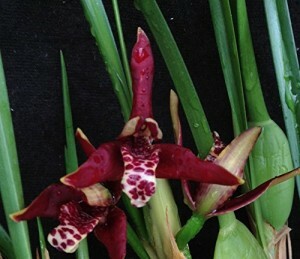 Balanced fertilizer is best for Maxillaria orchid growing. 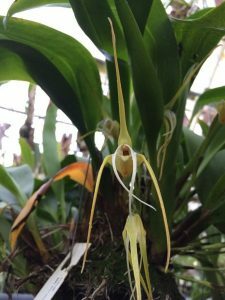 It is important to maintain high air humidity with substantial air moving because low air humidity isn’t good for Maxillaria orchids, but high air humidity without air moving will cause rotting. 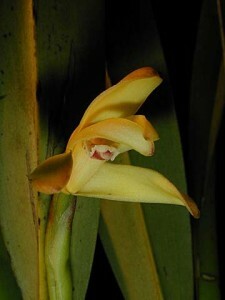 Temperatures should be warm to cool, with intermediate suiting for most Maxillaria species. Miniature species such as Max. schunkeana are better to be mounted on slabs.